Ever since it announced plans to create a 10 p.m. nightly talk show for Jay Leno, NBC has said it will give the strategy plenty of time to prove its worth. But reality may be less patient. While General Electric Co. (GE)'s network may be prepared to accept smaller audiences than it's accustomed to, NBC affiliates don't seem to be. 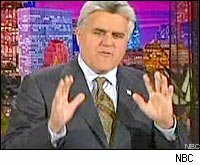 Station managers in Baltimore, Kansas City, and elsewhere are alarmed at the way ratings for their local newscasts have plummeted since the network introduced The Jay Leno Show and changed its format for the last hour of prime time, Joe Flint reports in The Los Angeles Times. It's hardly an unanticipated problem. NBC's Boston affiliate, WHDH, initially said it wouldn't air Leno, fearing that the show would be a weaker lead-in for its 11 p.m. news than the hourlong dramas Leno replaced. The station reconsidered after NBC Universal strongarmed it -- but what would happen if a number of affiliates increased their clout by banding together against the show? They may not have to. As my colleague Jonathan Berr noted recently, Leno's show could be among the first casualties in the takeover of NBC by Comcast that's now in the works. The Washington Post's TV critic Tom Shales says this season will "almost certainly be [Leno's] last at 10," assuming he makes it even that long. NBC has an answer to all this, albeit not a very convincing one: The network says the ratings for Jay Leno will rise in future months when the dramas it now competes with at 10 go into reruns. That would've been great logic 10 years ago, when there was still such a thing as the rerun season. Nowadays, the dead spots in the networks' schedules are when cable channels introduce their biggest shows, and the networks have responded by staggering their schedules and filling up the summer with reality series. NBC has lost a third of its 10 p.m. audience compared to last season, thanks to Leno. Those viewers didn't flee to CBS (up 1 percent, year-over-year) or ABC (down 9 percent); they left network TV altogether, as viewers have been doing at a more gradual rate for years. No one has yet figured out a way to get them to come back. Tepid late-night-style talk is not going to do the trick.